Are you ready to make that change? Are you ready to get REAL results REAL fast? My New You Summer Fix fitness group starts Monday, July 6th… just in time to kick into gear after holiday parties and indulgence on the 4th! These fitness groups are an amazing community of women (and sometimes men!) all working toward their health and fitness goals. My team of coaches and I will provide meal plans, shopping lists, useful nutritional knowledge and tips and motivation for staying on track in a busy life! It is REAL fitness, REAL nutrition, and REAL results. People ask me all the time, what’s my secret, how do I stay in shape and looking (somewhat, lol) younger than my real age.…The awesome truth is, there is no secret. There’s nothing fancy to it. I just believe in a little exercise and developing healthy, sustainable eating habits. It is a lifestyle! And whatever I recommend to my friends is what I personally do because I know it works and I know it’s possible once you learn how to make those small changes. If you want it and you put in the effort, you will see and FEEL a change in just 21 days, three little weeks. Just 30 minutes a day of exercise, clean healthy eating 80 – 90% of the time (gotta have a cheat now and again) and one superfood shake a day. That’s all I do to stay in shape and full of energy. And that’s all my challengers do and they see incredible results: clothes fitting that haven’t fit in years, sugar cravings BUSTED, soda habits kicked, strength and energy increasing and pounds dropping. It’s a beautiful thing. 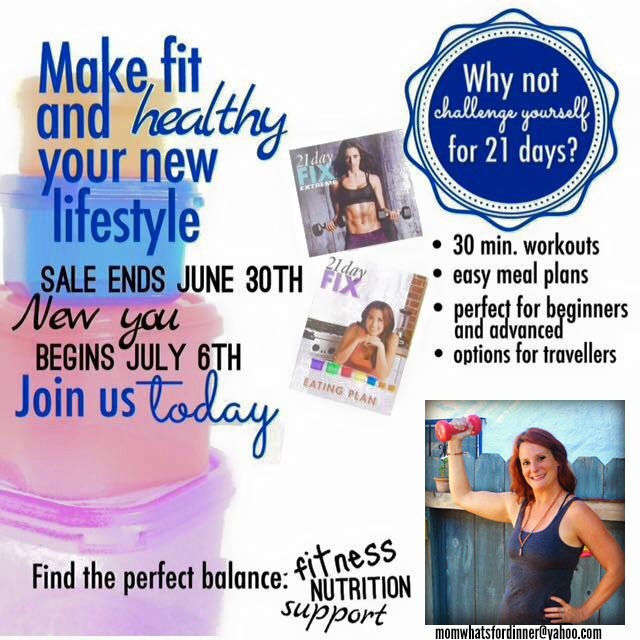 What is even more exciting is the program that will help me TEACH you how to make this lifestyle change is on PROMOTION (BIG SALE!) until the end of June! You know the program with the little color coded portion containers and the 30 minute workouts? Yep, 21 Day Fix and 21 Day Fix Extreme is only $11 when you buy a bag of Shakeology. Um, hello? If you have been on the fence about trying this bestselling, most effective workout program, NOW is the time. It doesn’t go on sale like this more than a few times and year AND it’s officially bathing suit season, so what’s a better time than now?